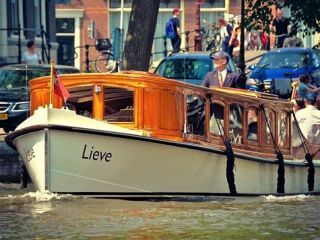 ‘De Lieve‘ is a perfectly maintained vintage saloon boat from the 1930s. You can sit either inside or outside with a maximum number of 12 people. This boat is owned and operated by a nice couple that takes pride in providing excellent service. They know how to arrange gourmet food and matching drinks.